Carte de la France Sous les Rois de la Premiere Race. 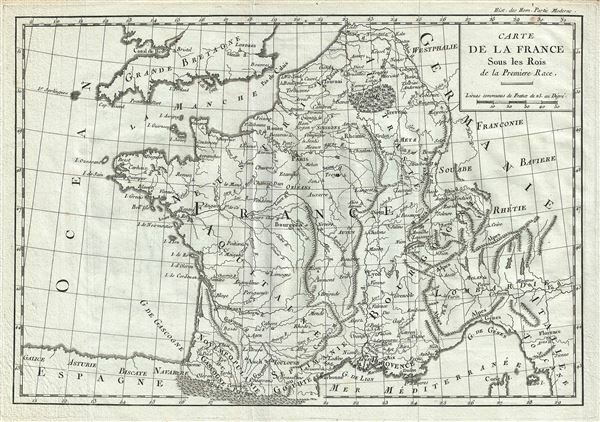 A beautiful 1782 map of France in antiquity by Jean- Baptiste-Claude Delisle de Sales. It covers the region from the English Channel south as far as the Mediterranean and Florence in modern day Italy. It includes the modern day nations of France, Luxembourg, Belgium and Germany west of the Rhine, along with most of Switzerland, the western part of Northern Italy and parts of Netherland. The map identifies several important cities and towns and uses ancient names throughout. Rivers, islands, and other topography is noted with forests and mountains beautifully rendered in profile.